Naloxone is an opioid antagonist that reverses the effects of an overdose resulting from heroin, fentanyl or oxycodone by blocking opiate receptors in the brain. In a push to reduce opioid-related overdoses and deaths in the province, the Quebec government has provided free access to the drug at pharmacies since the fall of 2017. 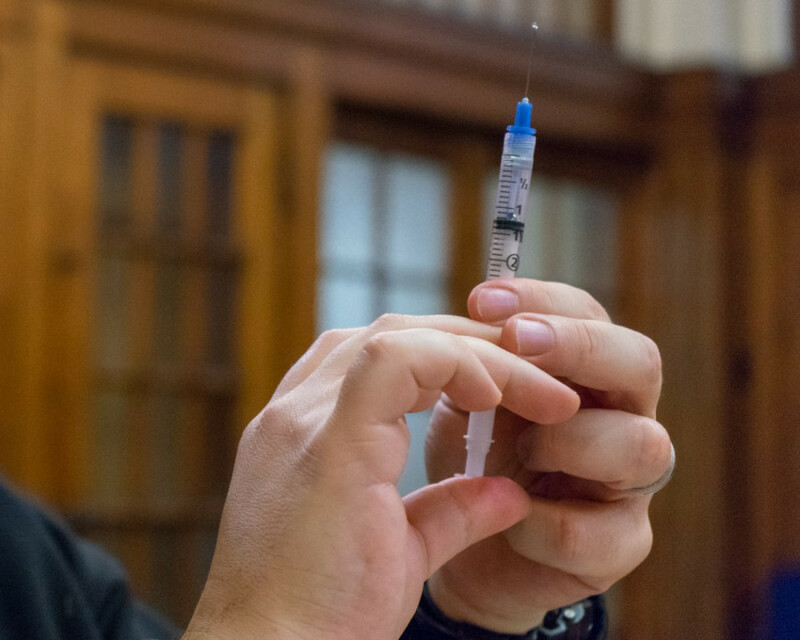 Last semester, Davy began providing free naloxone training to the public. Since his small beginnings, Davy’s workshops are gradually growing, as he’s planning to run four trainings this January. By mid-December, two of the trainings are already at full capacity. Opioid-related overdoses and deaths have been steadily climbing in Canada. In 2016, there were 2,816 apparent opioid-related deaths, with the number jumping to 4,000 overdoses in 2017. In the first half of 2018, Canada surpassed half of last year’s rate, with the country seeing 2,066 opioid-related deaths between January and June. In the same timeframe, Quebec ranks fourth place in overdose related deaths, at 195. However this number is not exclusively opioid-related, as the province records deaths by illicit drugs altogether. Davy first got the idea to host workshops on naloxone after he attended a conference hosted by the Canadian Mental Health Association. Sessions on how to administer the drug were held, but he said he only saw about 20 people in attendance, out of a conference hosting thousands. “It kind of says something for the public’s awareness or interest about this to me,” Davy said. The session he attended specifically talked about the nasal spray version of naloxone called NARCAN, as well as the kits with needles. Davy said after finding out he could get naloxone kits for free at the pharmacy, he felt that if the issue is as vital as the rates are making it out to be, everyone should know about the drug. Davy was already involved in community outreach with fellow social work students at McGill, where he first pushed for naloxone awareness. He and his colleagues often provide support for the mental health of people in the Montreal community, by providing company and meals for those on the streets. 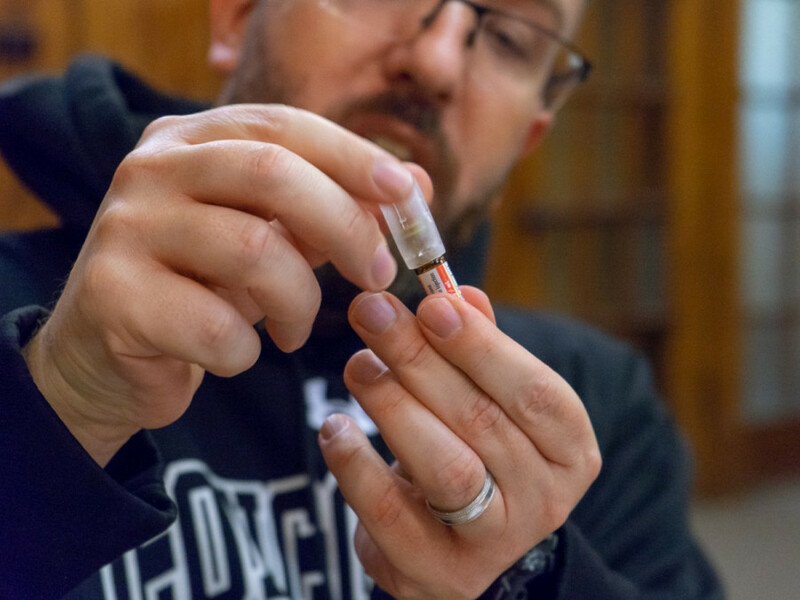 Davy pushed for his colleagues in McGill’s School of Social Work to have naloxone on hand, leading them to carry kits along with them, even offering it to people on the streets. “We started getting interest from people in the rest of the social work community at McGill, then outside the community,” said Davy. “I decided to open it up to everybody and then from there the takeoff has been great.” He said the first session started off with 40 participants, leading to about 100 participants in recent sessions. 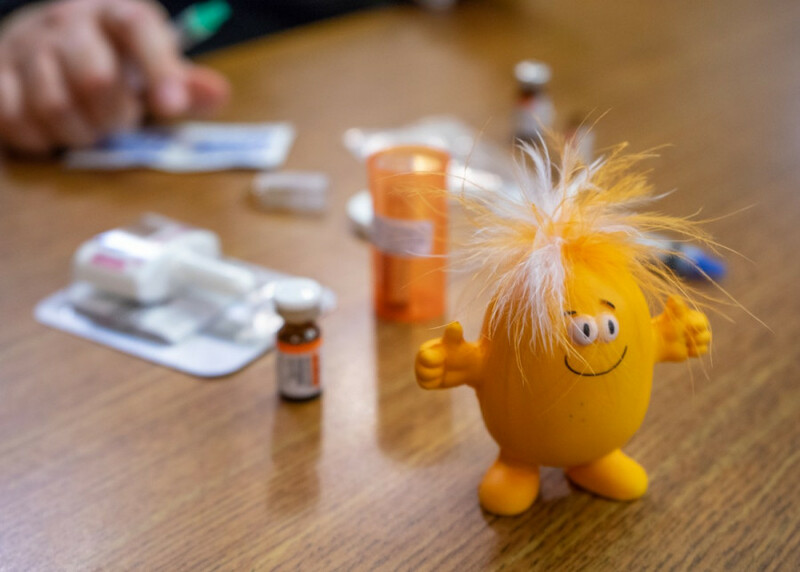 “Something that’s scary for a lot of people is the needles, and that’s part of what I’m doing in the training, is trying to help people to feel more comfortable with them and to know what to do with them,” Davy said. 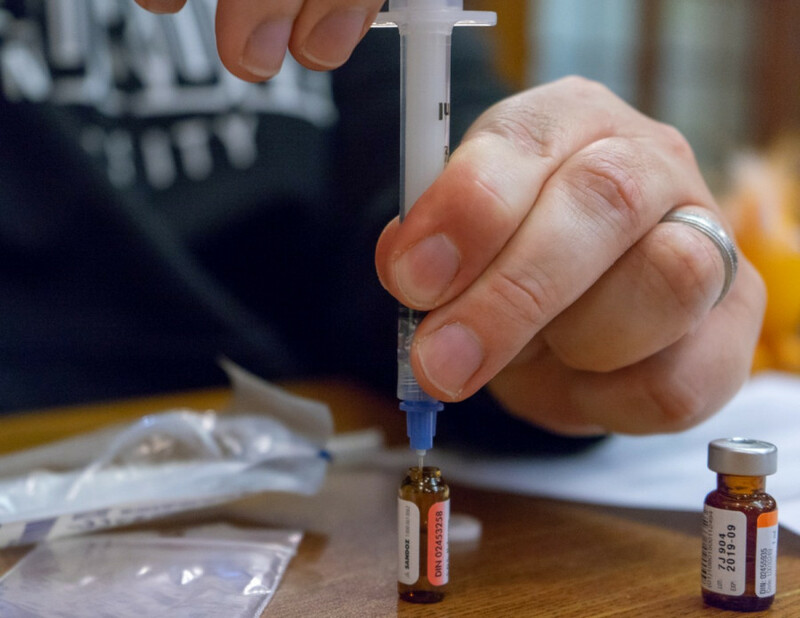 He added this is part of the issue with the training offered at pharmacies, which he says are typically rushed and don’t put an effort into making sure the person who will administer naloxone will be comfortable throughout the process. Davy has updated his trainings since the start of this year, with a focus on how to perform cardiopulmonary resuscitation, something he says pharmacies fail to provide during their trainings. Apart from training, Davy said he wants to reduce stigma around opioids. “I want people to know this impacts everybody so I’d like them to share that with at least one other person,” said Daivy. He also advocates keeping the kit in a visible place to spread awareness of the drug to others. “There are 21 million prescriptions of opioids in Canada right now, that means that these opioids are in our homes,” said Davy. Davy said he would love to conduct workshops outside of Montreal, with a hope to host some in Kahnawake. He said he’s in the process of starting a non profit organization with some colleagues and will eventually be looking into getting funding. Davy said the aim of the organization will be to enhance and a support the growth and maintenance of mental health in the greater Montreal community. He said the funding won’t cover the kits, as the Quebec government already funds up to eight doses of naloxone per person each day, but it will expand the programs they offer, such as outreach work, food services and educational programs at schools. Davy said if people want to donate they can do so through the PayPal link on his overdose training website. “All funds go towards expanding and enriching the services we offer now, and will offer in the future,” said Davy. Naloxone isn’t just for people on the street, Davy said, this is something that’s around us and can impact anyone. Obtain a naloxone kit. Kits can be accessed for free at a Quebec pharmacy for those covered by the The Régie de l’assurance maladie du Québec. 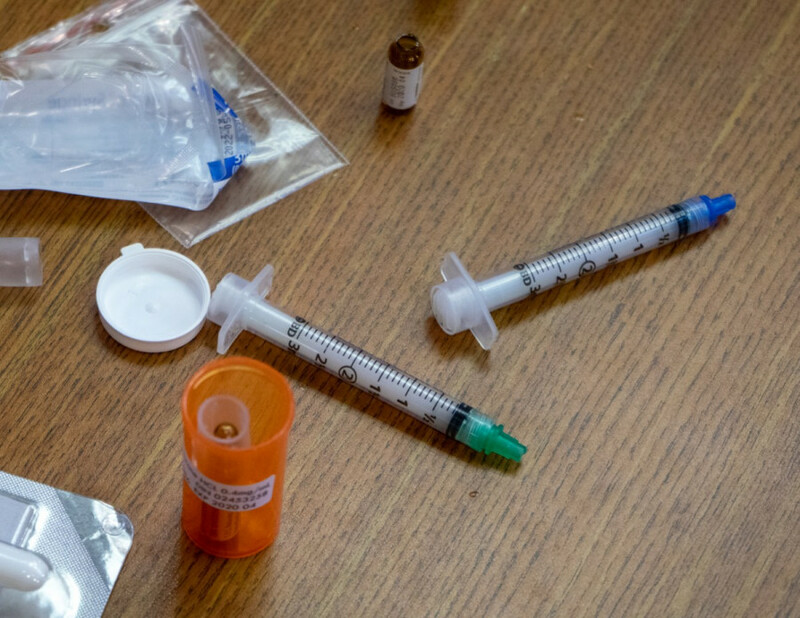 Those not covered by the RAMQ can get a kit at safe injection sites or other harm reduction organizations. To see if someone is having an opioid overdose, Davy said to check if the person is having difficulty breathing or isn’t at all. Their pupils will be pinprick, and their skin may be clammy to the touch, or they could have blue fingernails or lips. He said first you should try to stimulate the individual. Try to wake them up, call their name, if this does not work, he said to rub their sternum with your knuckles. This is painful and will wake them up unless they are in a deep overdose. He said if there is no response, open their throat, make sure there’s no food or vomit blocking the airway, and then begin CPR. Not all versions of naloxone kits provide this, but some include a mouth guard to create a protective barrier while giving someone, potentially a stranger, CPR. He said to breathe into their mouth every five seconds and to see if there are any changes, if not, administer naloxone. If someone else is with you, you can ask them to call 911. 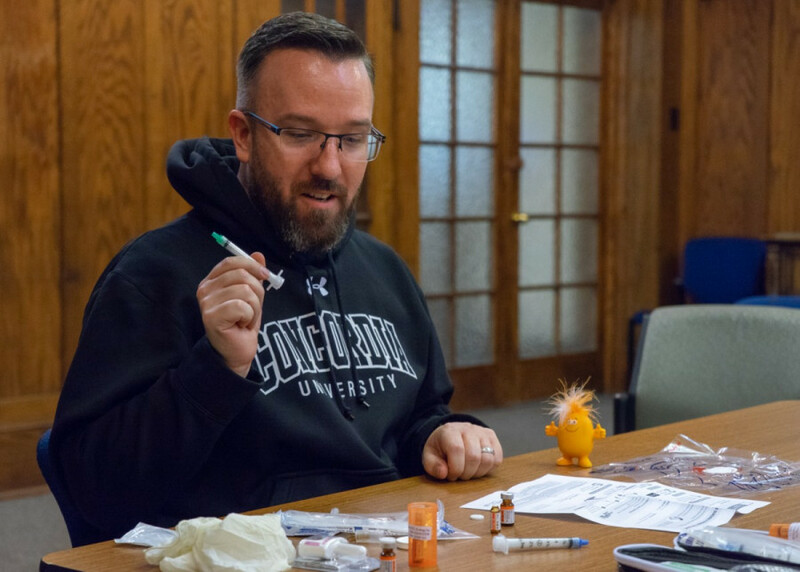 For the purposes of his workshop, Davy uses a small squeezable stress toy to inject the naloxone into to show how to use a needle. Take off the lid of the naloxone. If you’re not sure an overdose is happening, Davy said to use it anyway, as there are no risks to naloxone if the person is not suffering from an overdose. Inject the naloxone into the syringe. Davy said to keep in mind that naloxone may revert a heavy user back into the state of withdrawal, resulting in vomiting or extreme confusion afterwards. Squeeze out some of the naloxone to reduce risk of air bubbles, for good measure. Davy said not to be concerned if there are air bubbles as the injection is intramuscular rather than intravenous. Before injecting naloxone into the person, use the alcohol swab provided within the kit to disinfect the area of the skin you will be putting the needle into. Inject the drug into an area that has a lot of muscle, such as the thigh, arm or buttox. Davy said for people who are very skinny, try to squeeze and gather their muscle in your hand while you inject the person. Davy said that stress is normal in this situation, however, deep breathing is essential to help your focus and calm yourself down when using the needle. He said to push the needle until you hear a click, indicating that all of the naloxone has been injected. Immediately call 911 for help if you haven’t already. Naloxone can often induce the user into withdrawal because naloxone bonds onto opiate receptors, knocking the opioid that was inducing an overdose off the receptor. As a result, this may cause nausea and shaking. The person may wake up confused or aggressive. Davy said if they need another dose, inject again. He said it’s very important to stay with the person until the ambulance arrives, as naloxone can wear off because most opioids, such as heroin, have a longer half life. A half life is used to describe how long opioids last in one’s system. Davy said naloxone has a half life of about 90 minutes, whereas other opioids have a half life of maybe 12 hours. It’s vital to ensure the user doesn’t redose after having naloxone, because it can cause an overdose two times as bad as the first. Women and Sterilization: Why are Young Women Still Being Denied Tubal Ligation?